Back home from drupa 2012 and preparing to write some insightful articles about the show, the announcements and what it means for our industry over the next four years, so watch for those. Hint of what’s to come: for me, this was the Hybrid drupa. But first I wanted to offer some special recognition from a journalist’s perspective. So there are lots of demands on a journalist at a trade show (there were 2,400 journalists from 75 countries at drupa). When an exhibitor does something that is out of the ordinary, it captures our attention and creates a lot of buzz. Landa Nanographic Printing is probably the best example of that at drupa 2012—or any other drupa, for that matter. We even set up a special page on WhatTheyThink to track all of the discussion. We were also the first media outlet to interview Benny Landa, and those videos are available on that special page in case you missed them. Landa was everywhere at the show. You couldn’t miss the signage. The booth (or stand as they say in Europe) was fabulous. And it was packed the entire show. The day before the show opened, Landa conducted a press conference attended by more than 300 members of the press. You can see the video here. Mr. Landa presented personally at several shows per day in a 300-seat theater, and those shows were sold out (so to speak), causing him to project 2 shows per day to big screens outside the auditorium. I had the pleasure of attending a small “boardroom-style” meeting with Benny, along with four other journalists, after which he dashed out to do another show, and invited us to watch it from “the bridge,” overlooking the booth. A colleague and I estimated that there were some 3,000 people watching the show, between the folks in the auditorium and the folks crowded into and around the booth. Yikes! I will be writing more about Landa Nanographics (products not likely to be available until 2014 at the earliest) in a future article. 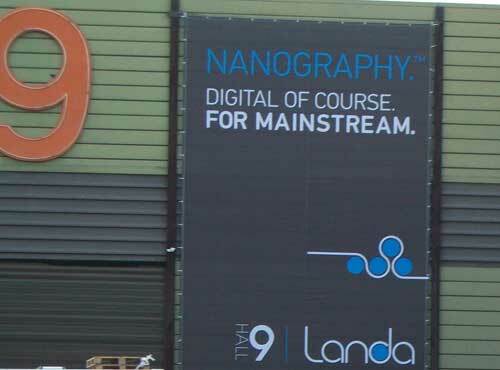 But Landa Nanographic Printing deserves big-time recognition for capturing the attention of a large number of the 314,500 visitors over the two weeks of drupa 2012. I hope Benny is getting a few days of rest on a tropical island somewhere—he must be exhausted. Although that’s not his style. He’s probably back in Israel hard at work on his many ventures. Of all of the other press conferences I attended, EFI’s stood out. 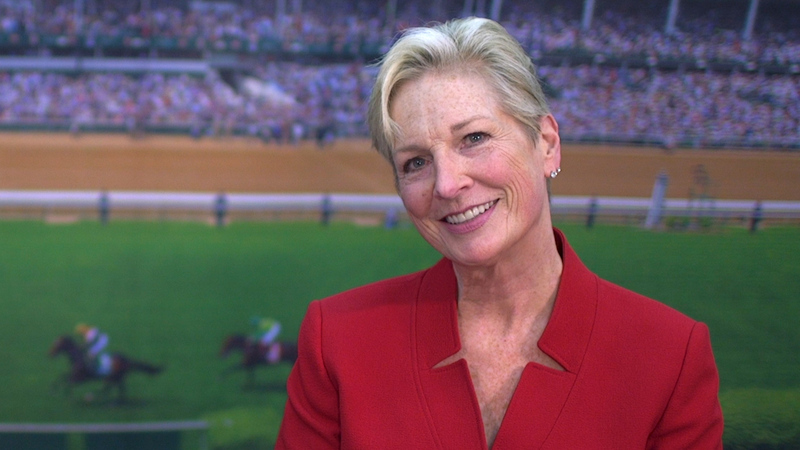 It was a blend of fun, information and—most importantly—customer recognition. 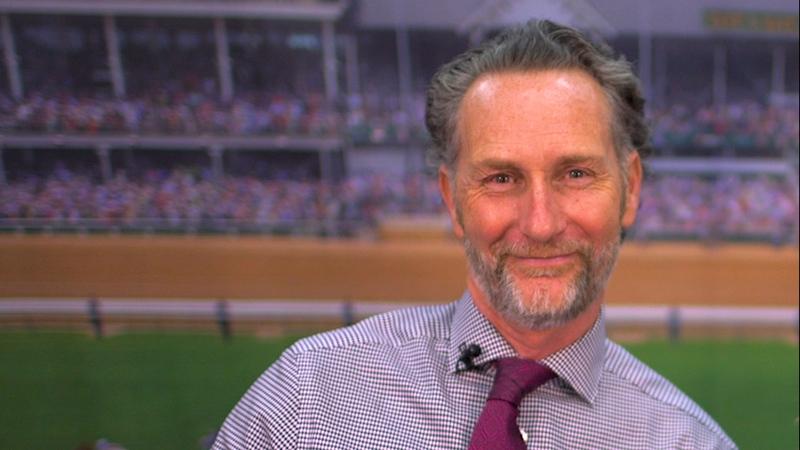 My colleagues Andy Tribute and Frank Romano have both commented on trade show press conferences (if those videos/articles haven’t run yet, they will soon, so watch for them.) Most of us attend these sessions hoping to learn something new. In many cases, the company has already done a pre-drupa briefing or sent out a flurry of press releases, with nothing beyond that discussed at the press conference. In most cases, we are taken through a large PowerPoint presentation going over product speeds and feeds that we already have available to us from pre-show press releases. By the end of the first week and having attended umpteen press conferences that are all basically structured the same, we are PowerPointed to death and might pick up a few more snippets of information. Of course, the opportunity to ask questions is always a benefit. But the way the press conferences were scheduled—normally a half an hour back-to-back with the next one down two floors or up one and halfway across the center—made it difficult. Seems like you were always late arriving or leaving early to catch the next one. EFI took a different approach. First, they asked journalists to meet at their stand about a half hour before the start of the press conference. When we arrived (about 150 of us), they had the paparazzi on site flashing cameras in our faces as they escorted us outside to waiting limousines (turning the tables on the media!). Once we arrived at the conference center, we were escorted to their room, but first, a stop to have our photo taken with Oscar (the press conference had an Oscars theme). CEO Guy Gecht started by introducing himself as Benny Landa, and that got some laughs. But seriously, he stated that even though EFI had a number of new announcements for the show, he wasn’t going to go through those in his presentation. Instead, he talked quite frankly about EFI’s near-death experience in the early part of this century (around drupa 2004) and the transition the company has made since then to sustainable growth—some pretty impressive numbers, including 47% year-over-year growth in EFI Inkjet and 14% year-over-year growth in total revenue. He talked about the steps the company had taken to transform and how important it is for all of us to see the “window of opportunity” ahead of us, and be ready for it when that window shifts to the next big thing. But the best part was the awards EFI presented to its customers in the first-ever “EFI Transformer Awards.” All too often—in fact, most of the time—the customer is completely missing from these press conferences. 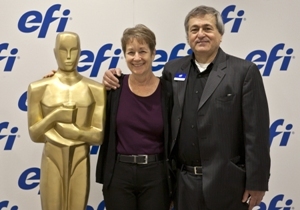 EFI made the event fun, different and didn’t miss a beat (their drupa theme was “Don’t Miss a Beat”), presenting 7 different customers with awards (small Oscar statues) for such things as Fast Mover award, New Markets award and Most Integrated award. Hats off to EFI for a fun press conference with thought provoking content and recognition for the customers who helped them achieve their double-digit results. 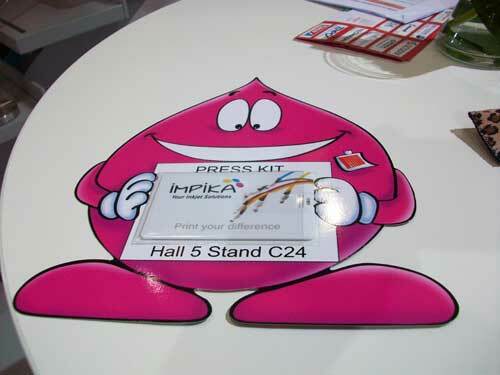 Some of you may not be familiar with Impika, a French manufacturer of inkjet presses. A search on WhatTheyThink yields a number of press releases the company has done, especially leading up to drupa. 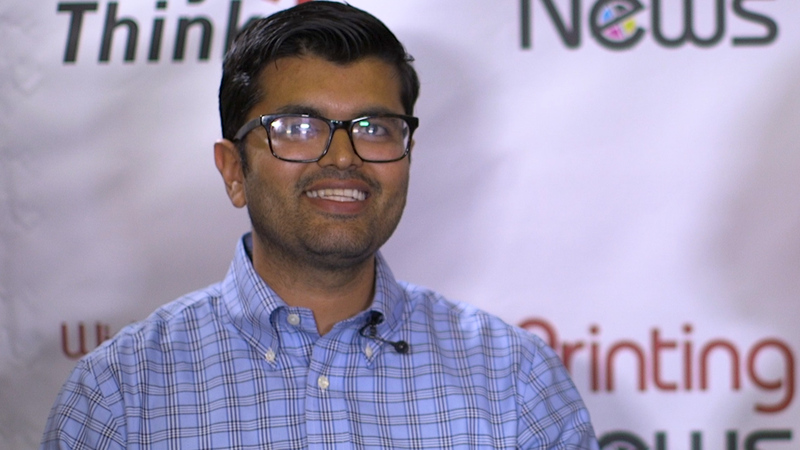 Founded in 2003, the company offers production inkjet solutions focused on the transactional, direct mail, transpromotional and print on demand markets. The company used a talented industrial designer that gives the presses a clean, modern, yet friendly look. Customers can even choose what color trim they want on their press. Imagine my delight when I was handed what has to be the best press kit at the show, an ink drop cartoon character holding a plastic card with a USB drive embedded. Very cute, clever, and very effective. I didn’t bring a lot of paper home with me, but I sure brought that. See the image below. Nice job, Impika! And, by the way, the products are pretty impressive. Worth a look! Finally, I wanted to comment on Kodak’s press conference. The good news was that there were no PowerPoint slides. CEO Antonio Perez spoke to a filled room about Kodak’s current troubles, rich history and optimistic outlook for the future. He spoke for about 15 minutes leaving plenty of time for questions, and questions there were. 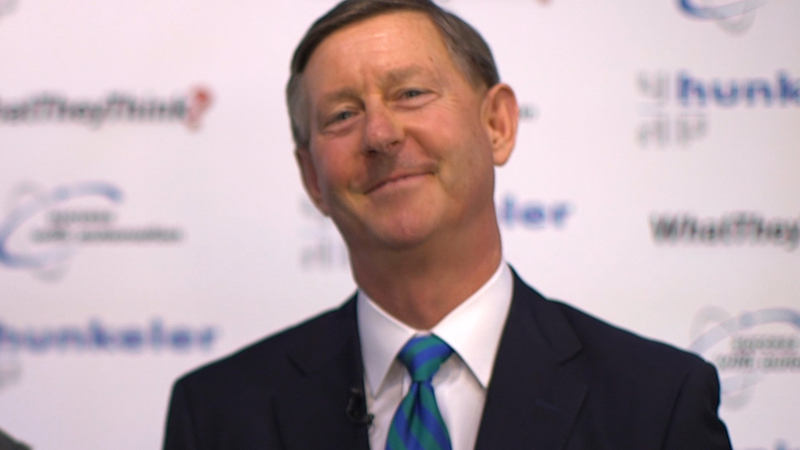 The discussion got quite heated at times, but he was steadfast in expressing his belief that the company would emerge well from its current Chapter 11 bankruptcy action, indicating that its emergence plan was already in the works. Of course, being a public company and in Chapter 11 to boot, Perez was somewhat limited in what he could say, but I felt that he did a good job of succinctly stating the company’s position and fielding the many questions from the media. Kodak did have an impressive presence at the show with its new theme, “Yellow Changes Everything.” I’m not really that thrilled with it, but I’m told it grows on you. 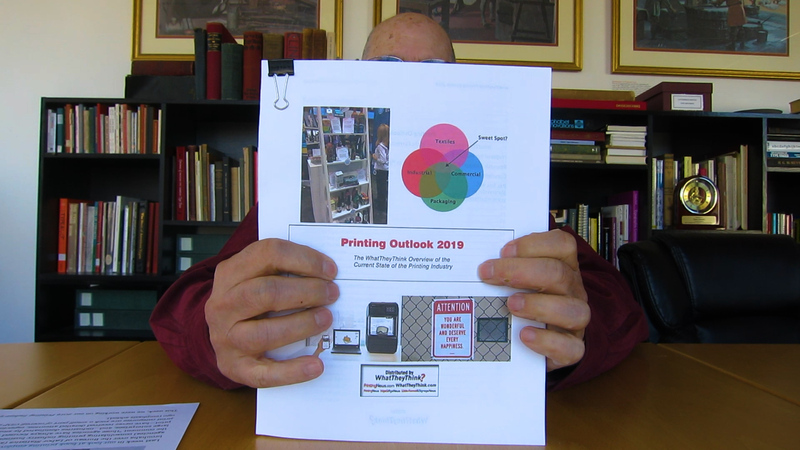 (For more on company themes at drupa, check out Frank Romano, curmudgeon emeritus, as he reviews a few of them.) At any rate, the Kodak folks were holding their heads high and looking toward the future, and their stand seemed pretty busy the few times I stopped by. Watch for the rest of my drupa commentary over the next several days. And by the way, WhatTheyThink is already planning its coverage for drupa 2016, June 2nd through 15th. Meanwhile, we hope to see many of you at Graph Expo in October, where we will be doing more video and covering the show in depth. Your articles on Drupa are great and WTT has done a superlative job of reporting almost every detail. I would like to bring out a point that really bugs me, the lack of presence of Adobe and Apple. These two companies owe a great deal to the graphic communications community and they are constantly ignoring that role we all played in building their respective companies. We need to organize our thoughts and voice our concerns.